The tiny house movement is, well, huge, and a resurgence of simple living is sweeping the nation. So, what’s the big deal about living in a house the size of a shed? Above being the biggest home trend since industrial kitchens, tiny homes are energy efficiency superheroes. Even if you aren’t looking to downsize to tiny house living, there are many energy-efficient secrets contained in the world of living small. The typical American home is 2,600 square feet, 1,000 more square feet than the average home 50 years ago. In a complete 180-degree flip, tiny houses are on average around 186 square feet, and are all the rage. Energy-efficient houses are not just for off-the-grid nonconformists or TV dream homes anymore. More and more, the dream of green, tiny house living has become a reality in the mainstream housing market. Tiny house enthusiasts give inspirational credit to Henry David Thoreau, who spent more than two months in a 150 square foot cabin in 1854 journaling his time in “Walden.” Skip ahead to 1987, when Lest Walker published a book called “Tiny Houses: Or How to Get Away From It All.” Different authors continue to publish books featuring tiny living spaces as interest grows with blogs, TV shows and even an American Tiny House Association popping up. 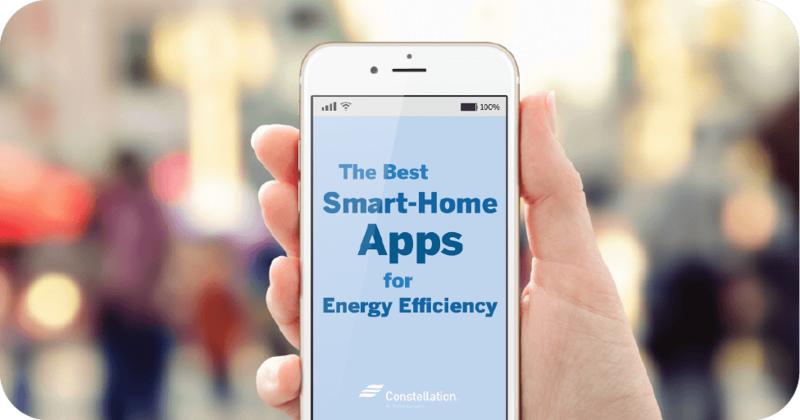 At Constellation, we love a good trend, but home energy savings is what we’re after! Making a tiny house energy efficient isn’t too hard — the consensus among those searching for the energy saving secrets of a living small lifestyle is that smaller spaces usually correlate with a reduction in energy use. How do tiny houses reduce environmental impact and energy consumption? Smaller square footage = less lumber. Though it may seem obvious, many people tend to forget the energy use and products that go into the construction of a home, not just the energy-consuming appliances inside. 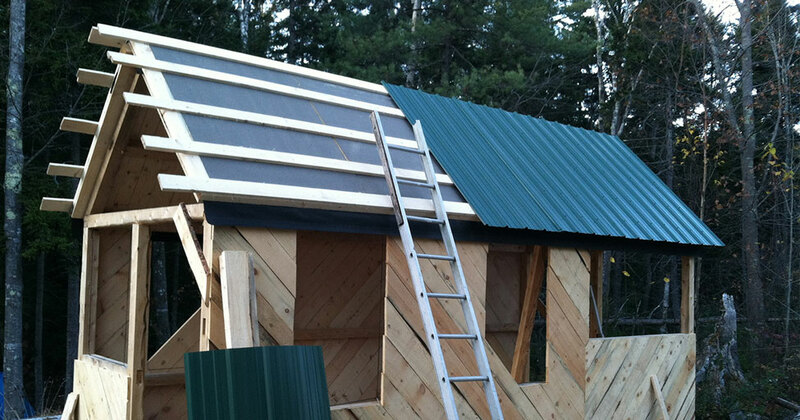 Building a tiny house is usually both cost and energy efficient! Consider this: it takes seven logging trucks to hold enough lumber for an average American home. In contrast, the lumber usage in tiny homes takes only half of one logging truck. Fewer light bulbs, lower electricity bills. There are three main elements of how you light your home that affect your electric bill at the end of the month. The types of light bulbs. There are two main types of energy-efficient light bulbs on the market: LED and CFL. Though CFL bulbs (the curly light bulb) use 25-35% less energy than a regular incandescent light bulb, LED bulbs (the long light bulb) use a whopping 75% less energy. Both are great energy-efficient alternatives to a regular incandescent light bulb, but LED takes the cake on the best bulb to light an energy efficient tiny house. The amount of light bulbs. How many light bulbs does your house need? Being inherently energy efficient, tiny houses have smaller living areas that require fewer light fixtures to light a home comfortably. The average house has 45 light bulbs installed to properly light all rooms, totaling an average of 12,773 of kWh a year. 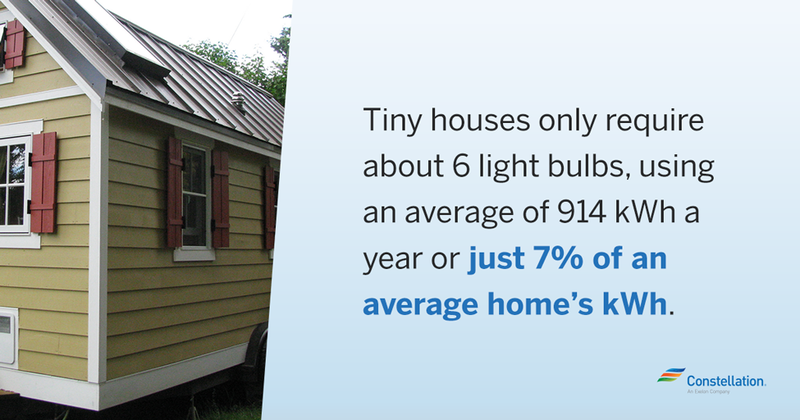 Tiny houses only require about six light bulbs, using an average of 914 kWh a year, or just 7% of an average home’s kWh! Your electricity rates. You might be used to paying for the amount (kWh) of energy you use per month, but have you thought about the rates that you pay for each kWh? With retail energy suppliers, like Constellation, you can choose a variable* or fixed-rate plan. With a fixed-rate plan, your rate stays the same, giving you a clear idea of the rate your energy supply will be billed at each month. Mix the perks of a fixed-rate plan with energy-saving light bulbs, and we think you might just be a happy tiny house-er at the end of every month! 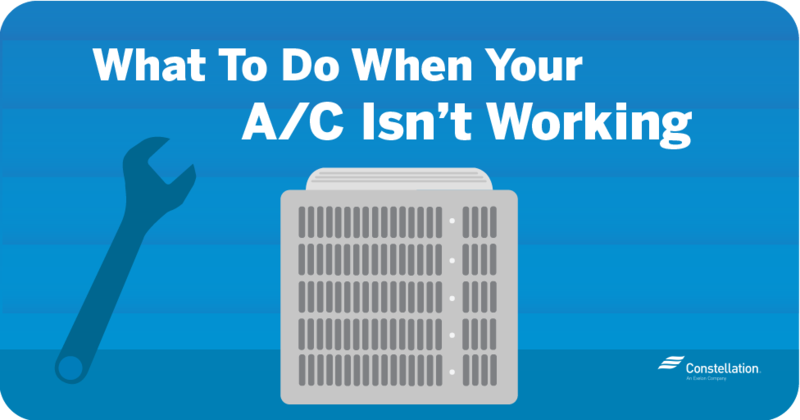 Heating and cooling is exponentially easier. Small spaces mean smaller areas to warm or cool. 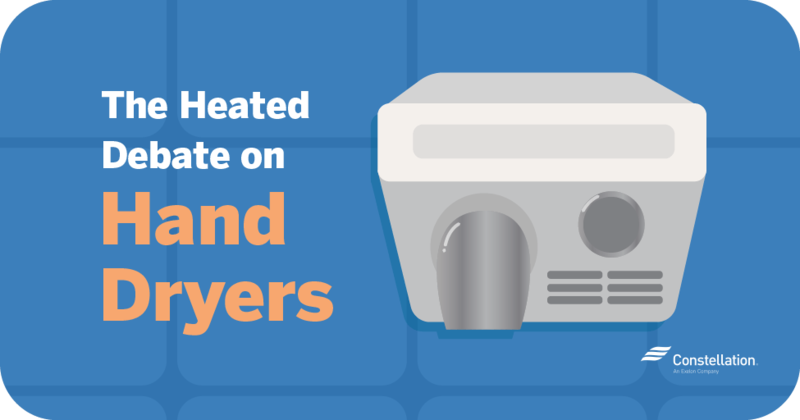 Heating an average house makes about 8,000 pounds of CO2 a year. 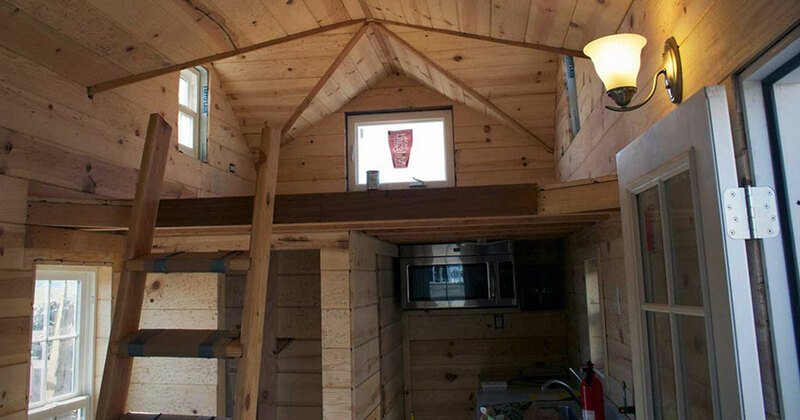 Tiny houses emit 558 pounds of CO2 per year. Cooling the average home makes about 4,000 pounds of CO2 per year. Tiny houses only emit 286 pounds of CO2 per year. Let’s be clear: tiny houses aren’t inexpensive. They usually cost somewhere between $30,000 and $40,000. If you find a tiny home that is cheaper (in price) than usual, you’ve either gotten very lucky or are getting a tiny house that uses cheaper (in quality) and less sustainable materials. So why do people adopt tiny house living? Affordability. The initial investment in a green, tiny house can look pretty steep, but the biggest point of living in an energy efficient tiny house isn’t saving money on building a home, it’s saving money in the long run with building a sustainable home. These energy efficient house ideas and decisions mean buying a $900 compost toilet with the expectation of saving 100,000 liters of flushed water per year, or installing solar panels to reduce your monthly electricity cost. Minimalism. Living in a green tiny house does not leave much room for extra belongings that you don’t need. Though buying things that you enjoy is a nice treat every now and then, many feel that living with fewer things brings a more relaxed and organized life. Here is a list from Becoming Minimalist of different areas of life that tiny house living can contribute to including clothes, toys, cooking utensils and televisions. Clothes. How many items of clothing do you own that you’ve worn only once or twice? It’s easy for us to accumulate different items of clothing from different times in our life, but holding on to unused clothes for too long can just create clutter. The beauty of living small forces you to take a hard look at everything you have, and get rid of what you don’t need. Donating clothes to thrift stores is a great way to give back to the community. If making money is your game, there are some websites that offer money for used items, along with brick-and-mortar shops. Cooking Utensils. There is an item creeping into your kitchen that quickly clutters and consumes space, the “Unitasker.” These sneaky, efficient-looking gadgets hold only one purpose. Usually, it is a task that can be done with another more versatile kitchen gadget, just taking a few more milliseconds to complete. Cut them out, and free up your kitchen drawers! Televisions. Think about it: a 100-400 square foot space with more than one television playing. The noise would be enough to drive anyone to madness. Thankfully, there are less intrusive options for a household, like tablets and laptops, that offer the ability to watch most of your favorite TV shows and movies. Best of all, most handheld computers and devices consume less electricity, creating a more energy efficient house. Mobility and Flexibility. What’s better than waking up in a new place still in the comfort of your home? Most tiny homes are built on wheels, completely capable of being towed wherever the owner is allowed to set up. With the surge of remote work (telecommuting and work from home jobs), tiny homes easily complement a transient lifestyle. When most work days feel like vacation days, you’ll realize that mobile houses equal maximum fun. Now that you know what a tiny house is and how to embrace the living small movement, you can decide whether it’s right for you or just fun to observe! In the meantime, the energy saving secrets of tiny house living are worth adopting knowing they can help reduce the cost of energy, organize your space and declutter your home. 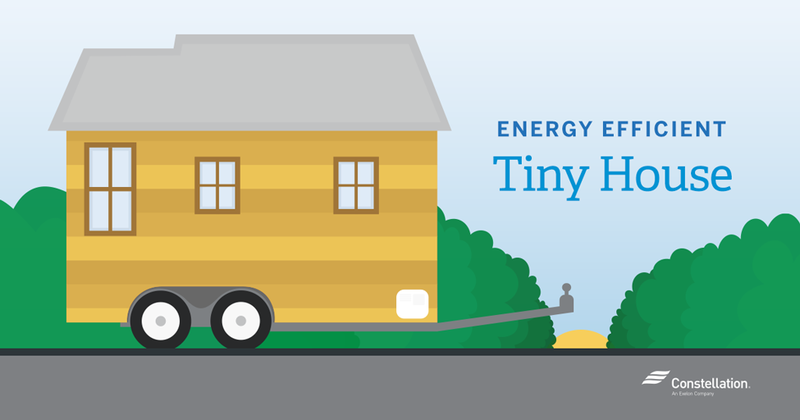 Who knew a house so tiny could make such a big impact in our lives and save so much energy? *Variable rates only available in Georgia and Texas.